The heat shimmered off the runway as the aircraft touched down on the tarmac of the Minneapolis-St. Paul airport in the mid-morning August heat. Zander (short for "Alexander" who is my youngest son) and I, were there that Friday on a mission - to meet our newest family member for the first time and bring her back to Virginia. Dixie, a diminutive and beautiful field bred English springer spaniel, just under a year old, was very much still the puppy. This journey had started almost one year prior when I had struck the bargain with Tony and Bethann Roettger, now very dear friends, for the little springer. They raised her in their home and started her down the gun dog path. In retrospect, we all gambled. Although increasingly a common phenomenon in the development of started dogs, at that time, a breeder committing to raise a dog in the home (not in a kennel) for a year while training the dog for the field was a relatively novel idea. But now, one can see a distinct upswing in this trend. In fact, I credit this with the relative ease of Dixie’s subsequent integration into the Schleider suburban household. It's also a major factor in her development as a mature, well-socialized gun dog equally comfortable in the home and the field. There was no way any of us could know a year in advance as to the outcome of this experiment; however, we would soon find out. It was a perfect day in North Branch, Minnesota, when we hit the small town’s exit off of interstate 35, and, although the weather was warm, it was not oppressively hot. In short, the conditions were excellent for what we had planned. We pulled into the Roettger Ridge Kennel driveway with the late summer dust of the road settling on us and the car. Bethann met us at the car as Zander and I piled out. A willowy woman with beautiful blue eyes and long lovely blonde hair, she led the way up the porch and to Dixie, who was enjoying herself thoroughly in the kitchen. She was very small, a little gangly as youngsters tend to be, and very, very pretty. 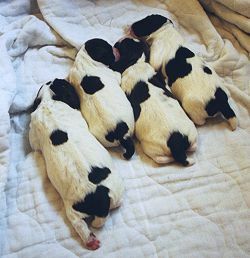 Her silky liver colored ears still retained the shortness we associate with field bred English springer puppies. Dixie's coat was beautiful, and deeply livered in the saddlebag-like markings that straddled her back. The white of her coat was snowy and un-yellowed. Instead of rushing Dixie, we sat on the floor close to her and let her sniff us and get to know us on her own terms. She was, and still is, a little shy of strangers so it took a little time for her to warm up to us. Soon, however, she was licking our fingers and crawling into our laps. 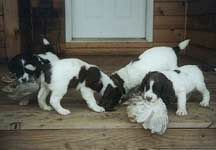 "Eyes wild with bird scent, the young springer was hot on the heels of the bird as it gained altitude." Tony joined us in the early afternoon, and we immediately took Dixie out for spin in the fields behind his home. A natural instructor with an infectious grin and twinkling, merry blue eyes, Tony explained to me where Dixie was in her training, the essential whistle commands and the do’s and don’ts of dog handling. After the tutorial, Tony planted a couple of chukars in the field and quickly brought Dixie out of a holding crate on a slip lead. 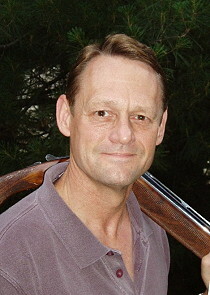 He broke open his 20 gauge Citori and loaded two shells. With me on the left, Zander on the right and himself in the middle (gunning and handling), he took the lead off of Dixie and immediately gave her the "get out" command. She exploded off the line, quartering beautifully toward Zander on the right. Tony gave her two quick "pips" on the 211 ½ pitch whistle to turn her back toward the center just as she ran to the outside of Zander. She responded immediately turning back toward Tony running about ten yards in front of us as we made our way down the field. Although the scenting conditions were less than optimal, she quickly made the first bird nestled in a thick clump of switch grass and nosed the chukar into the air as she snapped at the bird’s tail feathers. Eyes wild with bird scent, the young springer was hot on the heels of the bird as it gained altitude. Allowing the bird to gain altitude so as to give plenty of clearance between fowl and dog, Tony made an excellent head shot at about 50 yards. Dixie, in full pursuit, marked the bird beautifully, made the retrieve and headed back toward Tony. About five yards from Tony, she veered to the right and began to circle behind him in an attempt to evade the part of the process she dreaded - handing over the bird to handler. Tony deftly made a grab for the young spaniel and explained her response to me. "Chip, this is not unusual for a started dog. Dixie is young and still inexperienced in delivering the bird to hand. With training and practice, she will ultimately bring the bird directly to you." In all, I was quite pleased. Dixie had demonstrated excellent handling characteristics, sound bird finding skills and no problems with gun fire. She had beautifully marked the fall of the bird, and was pretty good on the retrieve. That night over Tony’s famous creamed pheasant, cold beer and Minnesota-style barbequed corn on the cob we celebrated new friends and a new member of the Schleider family. I knew that the day was a success when Zander surreptitiously bent over and gave the young spaniel a kiss on the head as we parted company that evening. Over the next several days, Tony would work diligently with me to impart the fundamentals of dog handling. We repeatedly worked the young dog on land and water, and at every turn Tony was there with a handling tip. On that Sunday evening at the Dulles International Airport baggage claim I knew Dixie was home to stay when Door, my wife of 29 years, saw the little springer for the first time. As Dixie licked her hands through the crate, Door exclaimed, "My Lord she is beautiful." Author’s note: this is the first in a series of articles that chronicle both the development of a talented young spaniel and the rights of passage of an inexperienced trainer and handler.